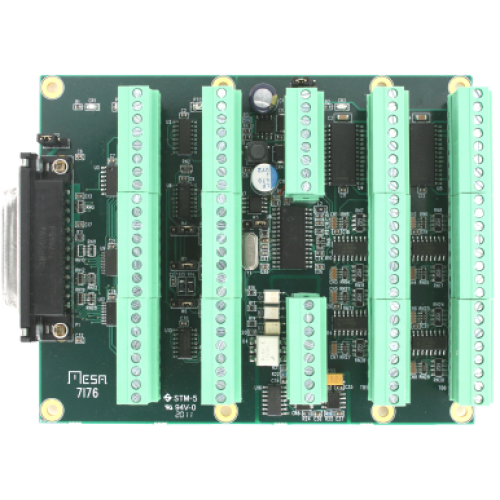 The 7I76 is daughtercard/breakout board for use with MESA's 25 pin I/O FPGA cards like the 5I25. 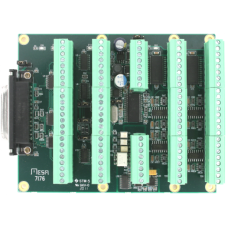 The 7I76 is designed for interfacing up to 5 Axis of step & dir step motor or servo motor drives and also provides a spindle encoder interface, isolated analog spindle speed control and 48 isolated I/O points for general purpose field I/O use. All step and direction outputs are buffered 5V signals that can drive 24 mA. All outputs support differential mode to reduce susceptibility to noise. An isolated analog spindle voltage with direction and enable outputs is provided for spindle control as is a single spindle encoder channel with TTL or differential inputs. 48 points of isolated field I/O are provided for general control use including limit switch and control panel inputs, coolant enable and tool changer control outputs. Isolated I/O includes 32 sinking inputs and 16 sourcing outputs. Inputs can sense 5V to 32V signals and the outputs can switch 5V through 28V signals. Maximum output load is 300 mA. Outputs are short circuit protected. In addition to the being able to read digital on/off status of each input, four input pin voltages are readable with 8 bit resolution, and two MPG encoder inputs are provided as an option on four field inputs. Field I/O is powered by an isolated 10-32V field power source. One RS-422 interface is provided for I/O expansion via a serial I/O daughtercard. All field wiring is terminated in pluggable 3.5 mm screw terminal blocks.